Qwickly Mobile support has ended. Qwickly version 2.5 an above no longer supports Qwickly Mobile. Qwickly Mobile takes the efficiency and ease-of-use found in Qwickly for Blackboard Learn™ and puts it in the palm of your users’ hands. Image being able to make courses available right from your smart phone, or post an announcement to all of your courses in three simple taps. Qwickly Mobile makes this, and more possible. 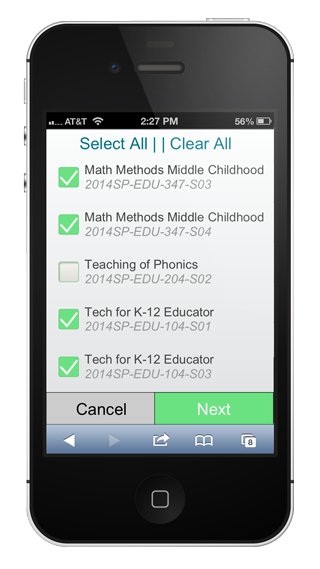 Unlike other mobile solutions for Blackboard Learn™, installing Qwickly Mobile is a piece of cake. Install the Qwickly Building Block, configure, and deploy the module or tool and you’re done. Qwickly figures out when users are on a mobile device and provides the mobile experience. Getting users to adopt the mobile experience is painless; once a user logs into Blackboard Learn™ and clicks on any part of Qwickly, Qwickly Mobile immediately springs into action - no pinching or zooming required. We mean it, no pinching or zooming required! And if a user finds Qwickly is their preferred interface on their phone, they can ask Qwickly Mobile to always show first when opening Blackboard Learn™ on their device. 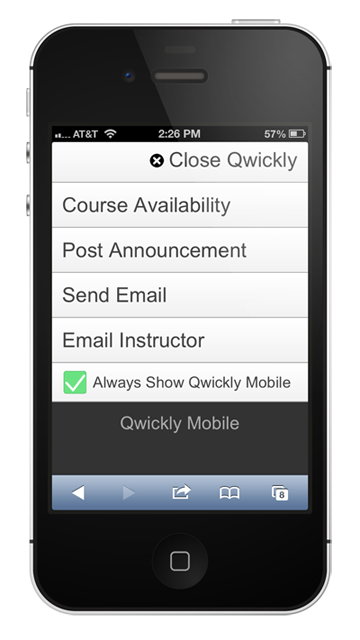 Make all courses available from your phone - in just a couple taps. 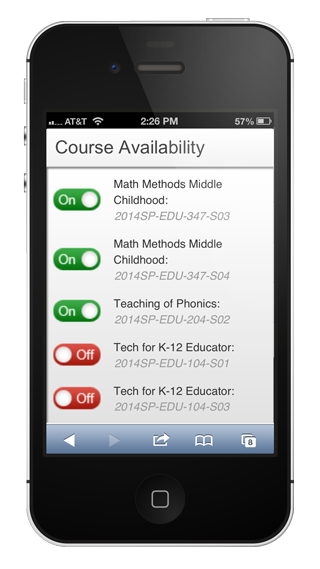 Select all of your courses in just a tap, or choose individual courses to target. Email form is optimized for mobile devices, no zooming required!